Lemon chickpea soup is a light and refreshing soup that’s packed with flavor and nutrition. The lemon, basil, and cilantro give the soup a fresh spring-like taste, while the chickpeas, sweet potatoes, and veggies make the soup hearty— something that will fill you up, without weighing you down. 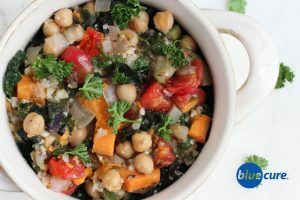 Check out the health benefits of the soup ingredients in our food guide: basil, tomatoes, chickpeas, sweet potatoes, cilantro. Wash and prep the produce. Sauté the onion and garlic with 1-2 tablespoons of water in a large pot. When the onions become transparent, add in the sweet potatoes. Continue to add small amounts of water, if needed to keep the veggies from sticking. Add in the zucchini and continue to cook. If using cauliflower rice, wait to add this until the end. If using chopped cauliflower, sauté with the zucchini. Add the tomatoes and chickpeas and continue to cook. Add 5-8 cups of water to the pot and simmer on medium heat. Add the bay leaves, basil, black pepper, and lemon juice. Add more spices, to taste. Simmer for 15-20 minutes. Add the kale or spinach just before serving and allow to wilt. Serve in bowls and top with fresh cilantro. Enjoy!